Undertow began on a blistering August day on the cliffs above Loe Bar in Cornwall, notorious for its riptides and dangerous currents. But as summer turned to bleak midwinter, and I watched a friend dragged down by the weight of depression, the book took a darker turn too. It was published a few years ago as Paradise, but it’s being rereleased today with its original title, and a new cover. Billie is desperate to find the father she’s never met. But moving back to her mother’s childhood home after Billie’s grandfather dies dredges up secrets – and Billie soon discovers that people may die, but the past lives forever. And some secrets are best left alone. Like not liking your best friend that much. But you don’t dare tell her because she holds reputations in her hand like eggshell, and if she moves just a finger you’re broken, over. Like keeping your mouth closed when you swig your Bacardi Breezer so she thinks you’re as drunk as she is. But when she’s not looking you pour half the bottle behind the wall. Even my little brother has secrets. Like he thinks no one knows it was him who drew the solar system on the kitchen ceiling. I knew. But I said nothing. Because those kinds of secrets don’t matter. Not really. They’re fleeting, like insects, mayflies. Alive for just a day. But some secrets aren’t mayflies. They’re monstrous things: skeletons locked in cupboards; notes slipped through the cracks in floorboards and between the pages of books. And, though the ink fades and the paper foxes, the words are still there. Waiting to be found. Or to find us. If I had known who he was – who I was – would it have changed anything? Or would I still have felt that weight on my chest, pushing the air out of my lungs so that, when I saw him, even that first time, I struggled to catch my breath? Would I still have lost hours, nights, thinking about his lips, his slow, lazy smile? And would I still have fallen in love, if I had known? Maybe. Maybe not. But that’s it: I didn’t know. Because it was Mum’s secret. Het’s secret. And, like all skeletons, it came out of the closet. And it found me. The key arrived three days after Luka left. Mum said it was serendipity. I didn’t believe in that kind of stuff, just thought it was a nice word, like egg, or pink. Back then, anyway. But maybe it was serendipity, fate, whatever, because Mum was already kind of losing it. Not big-men-in-white-coats style. Not that time. Just the little things. Like I found her in the kitchen with one of his T-shirts, just standing there, sniffing it. And when I called her Mother as a joke she slammed a glass of Coke down so hard it shattered; shards of transparency scattering across the floor, a slop of soda soaking into a dishcloth. It wasn’t like he was gone for ever – Luka, I mean. He was in Germany with some band for three months – ­guitarist for a kid half his age and twice his talent, he said. But that wasn’t true and he knew it. Luka was good. Which was why he was always getting gigs. Always leaving. He always came back, though. But that wasn’t enough for Mum. She said she was tired of it, tired of waiting. She said if he went this time then we might not be here when he knocked on the door come Easter. Luka laughed and said he wouldn’t knock; he had a key. He kissed the top of her head and wiped her angry tears with his string-­hardened fingers. But she pushed him away and said this time she meant it. None of us believed her. I mean, he’s Finn’s dad. She couldn’t just disappear, hide. But then the envelope arrived and everything changed. 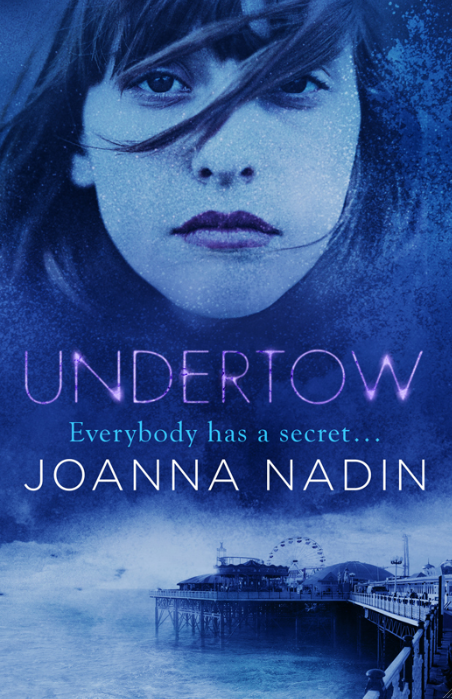 This entry was posted in Reading, Teen, Uncategorized and tagged Cornwall, du Maurier, Eden, Joanna Nadin, Paradise, Undertow. Bookmark the permalink. The forerunner to Eden, previously published as Paradise, this is being rereleased today in paperback and ebook.